Thepsatri Rajabhat University (TRU) was founded as a primary school for girls called “Lawasri School” in 1920. It was temporarily located at Chantarapisarn Pavillion in Narai Ratchaniwet Palace. In 1921, it was moved to a new location on Wichayen Road and offered secondary education. In 1936, the school was renamed “Thepsatri Wittayalai School” and started to offer primary education, secondary education and teacher training courses. With the wide vision of Field Marshal P. Pibulsongkram, the Prime Minister at that time, the school was moved to the present location on Narai Maharaj Road in concurrence with the new city plan. In 1940, it became a school for girls called “Thepsatri Wittayalai School”. In 1958 the school was renamed “Thepsatri Teachers College”. The very first teachers college in the area offered a range of courses in teacher training. In 1974, Thepsatri Teachers College began to offer undergraduate degrees in education and later in 1985 provided courses for undergraduate degrees in Sciences and Arts. On February 14, 1992 the college was given a new name “Rajabhat Institute Thepsatri” by His Majesty King Bhumipol Adulyadej. 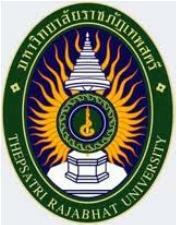 In June 2004, according to Rajabhat University Act, it became Thepsatri Rajabhat University. TRU is knowledge resources of local community and central Thailand. TRU support human, family, community and social to have quality and upgrade ability for compete in Thailand. To give opportunity in education for local community development. To create education system with quality and efficiency. To create knowledge base for increase powerful to local community and increase capability for compete in Thailand.